Browse > Home / Photo Releases / Exchange Student in Texas, Proudly Pinoy! Exchange Student in Texas, Proudly Pinoy! All set for a life-changing year! Nicole Joy Manzano Linsangan of Isabela School for the Deaf, now an exchange student in San Antonio, Texas under the AFS-Kennedy Lugar Youth Exchange Scholarship (AFS-KL-YES) Program, is all poised to make the most of her year. 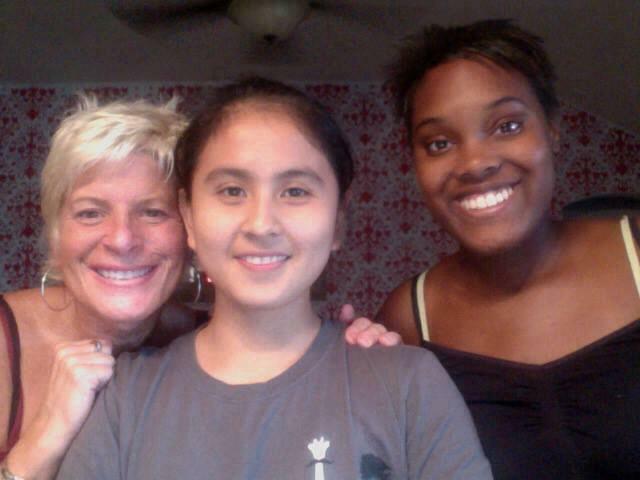 Shown above with equally proud foster Mom Caroll Ann Brodersen and foster sister Terisha Brodersen. Nicole is one of the 3 PWD scholars now in 3 American high schools in the U.S. for schoolyear 2013-2014, in this joint project of NCDA, US State Department’s Bureau of Education and Cultural Affairs (ECA), AFS-Intercultural Programs Philippines and the Department of Education. This batch will make a total of 20 PWD scholar-alumni, most of them joining the Council’s pool of smart rights advocates. For details on this program, check out this link.